Lt. Gov. Kim Guadagno of New Jersey, the Republican candidate for governor, greeted supporters in Mount Holly on Saturday. MOUNT HOLLY, N.J. — The former governor of New Jersey leaned on the table as she addressed a room of volunteers wearing headsets, who enjoyed the brief break from making endless campaign phone calls here. “As someone who was 16 points down a couple of weeks before my election,” began Christine Todd Whitman, the state’s first female governor, before she was interrupted by Lt. Gov. Kim Guadagno, a fellow Republican who hopes to become the second. “Say that again,” Ms. Guadagno said, smiling and pointing to Ms. Whitman’s 1993 victory as evidence that her campaign still has a chance. In the race for governor in New Jersey, every public opinion poll has found Philip D. Murphy, the Democratic candidate, with a double-digit lead over Ms. Guadagno. 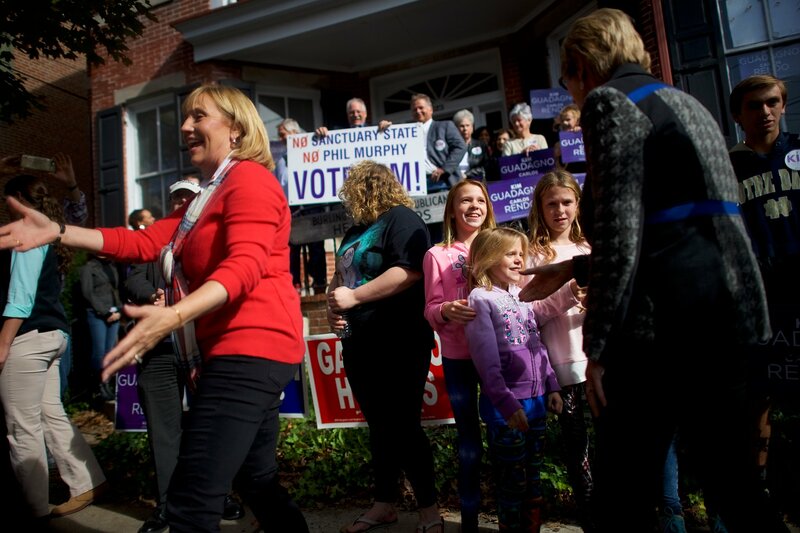 But with the frenzied vigor of a close election, both candidates hopscotched across the state over the weekend, with Mr. Murphy taking nothing for granted, Ms. Guadagno claiming momentum, and both candidates offering their clashing visions of the future after Gov. Chris Christie. For months, the race to replace Mr. Christie, a Republican, has flown largely under the radar of national politics, despite being one of only two governor’s races in the country. Mr. Murphy marched through the primary and has held onto an early lead, while Ms. Guadagno has been unable to escape the shadow of the unpopular Mr. Christie, whom she has served with for nearly eight years. But Ms. Guadagno’s campaign garnered headlines when she seized on Mr. Murphy’s pledge in the first debate to make New Jersey a “sanctuary state,” in opposition to President Trump’s immigration policies, and aired a controversial ad that inaccurately portrayed Mr. Murphy as a protector of violent criminals, twisting his statement to protect undocumented immigrants. The issue — absent for the first seven months of her campaign — became an energizing force for the Republican base. As Ms. Guadagno transitioned from taxes to “making New Jersey safer” at a rally in Flemington on Sunday, her mere mention of “sanctuary state” drew the largest reaction from the volunteers there. It is a tactic Mr. Murphy has repeatedly found both unfair and distasteful. The 2016 presidential election has loomed over this election. Ms. Guadagno, aside from her immigration policies that align with Mr. Trump’s, has largely ignored any mention of the president. But Mr. Murphy and his allies routinely point to the election as a rallying cry. A few hundred supporters who gathered in the chilly parking lot outside of a Murphy campaign field office shared Mr. Booker’s excitement and confidence. Teresa Cinnamond, a “lifelong Democrat” from Mountain Lakes, had no doubt: “One hundred percent he wins.” Her son, Will, a senior at Mountain Lakes High School, was equally confident. And he liked the change he thought Mr. Murphy could bring. While the crowds packed in to see Mr. Murphy and Mr. Booker, many of the gatherings Ms. Guadagno held on her four-day bus tour across the state were sparsely attended. Nonetheless, she projected confidence. “The momentum is going our way, I’ve seen these rooms get fuller and fuller today,” she said at a campaign stop here on Sunday. As Ms. Guadagno made her way back to her bus after the event, she was stopped by two familiar faces. “Kim!” Megan Yaede shouted. Ms. Guadagno smiled and stopped for a hug. Ms. Yaede’s sister Kelly Yaede is the mayor of Hamilton Township. They exchanged hugs and hellos before departing, as Ms. Yaede went to post pictures of the encounter on Facebook. “And she’s not Chris Christie,” another of her sisters, Barb Yaede, chimed in.